Located in Timaru’s CBD in the historic Oxford Building, upstairs above The Oxford restaurant, Shine provides classic spa and beauty treatments within a very special salon and spa space – high ceilings, natural light and views. Established in 2003, Shine is now under new ownership and management with Susan Irvine. Our team of hair stylists and beauty therapists will help you select the right style, colour and beauty treatments for every occasion. Consultations are free, and fun. Your time at Shine will leave you tingling with delight; from the tips of your hair, right down to your toes. You deserve a touch of luxury once in a while, and we are more than happy to be the ones to make you look and feel refreshed; body and soul. 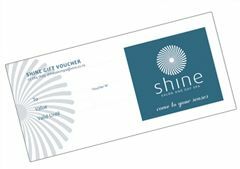 The gift of giving - delight someone today with Shine Salon & Day Spa vouchers.